What a blast! 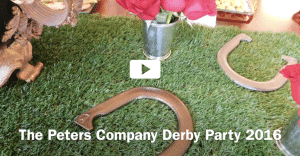 We had so much fun at The Peters Company First Annual Derby Party and we are so glad that over 100 of our friends and clients could join us! This was a great turnout and we couldn’t imagine a better way to spend a gorgeous Spring afternoon. We wanted to shout out a special thanks to Brittany Burnett from Chris Kids for coming to speak about the charity and thank you everyone for helping us raise over $1700! We are so thankful for your generosity! P.S. If you see any photos from the video that you would like us to email to you, just email kimber@thepeterscompany.com! ← Just Listed :: Beautiful Traditional in Vinings Place Swim/Tennis!